Make Your Princess Party Sparkle! All princesses love attention, so have your princess get all the attention she craves with this 15ft. x 15ft. "Sparkling" pink, purple and blue bounce house. 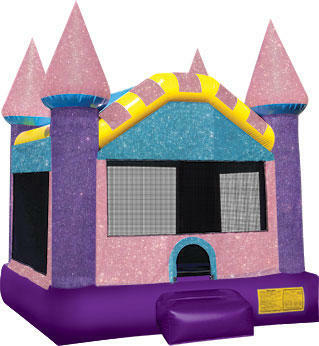 This Sparkling Castle Bouncer is perfect for your girls' party with over 200 sq. ft. of bouncing area, four giant purple spires at each of the four corners and finger safe mesh windows on all four sides for easy viewing. There is also a safety ramp at the entrance to protect excited children as they enter this unique bounce house. With sparkling glitter embedded in the vinyl, your princesses' party will sparkle and shine in the sunlight like no other. This Sparkling Bounce House is sure to add the sparkle in her eye! Reserve The Sparkling Bounce House Today!